In a medium saucepan, melt the butter with sugar, orange juice, and cranberries and bring to a light boil for 2-3 minutes. Let cool. Add the dry ingredients to a mixing bowl, we use my beloved Bosch, and stir together; then beat in the rest of the ingredients along with the cranberry/orange mixture once it's cool. Spoon into muffin cups or a buttered muffin pan. 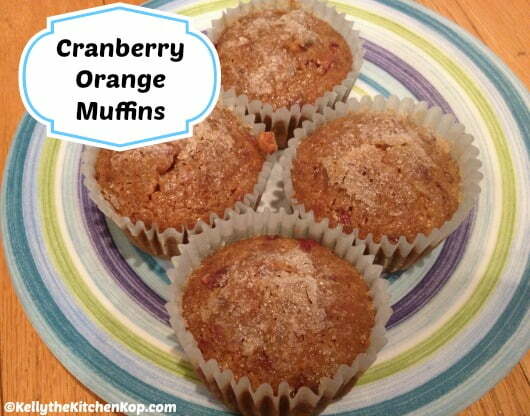 (I also made a few mini orange cranberry muffins.) Sprinkle sugar on top. Bake at 350*, or more like 335* if your oven runs hot like mine, for 13-15 minutes or so, just until the top feels set and it springs back when you push it a little.